Paul is probably the greatest of the apostles of Jesus Christ. St Paul the Apostle was God's chosen one to bring the message of salvation to the Gentile world. Please read Acts 9:1-31 before starting GraspingGod.com's free Bible study lessons, #2.18. Previous lesson: James Brother Of Jesus #2.17. 1) Paul unfortunately approved of a certain Christian saint's martyrdom. Can you name the person? 2) Did Paul know Jesus? 3) How did Paul die? Welcome to another exciting Bible study, one you should find very informative. Let's talk about St Paul the Apostle - possibly the greatest author in human history, not to mention the greatest saint. We have many of St Paul the Apostle's personal writings to the churches he started. The letters he wrote are included in our Bible, therefore, we have TONS of material to reconstruct the life of Apostle Paul. St Paul the Apostle was given the birth name of Saul, honoring his Jewish heritage and lineage in the tribe of Benjamin. He was born into Roman citizenship, meaning his father had to be a Roman citizen. The city of Tarsus, Cilicia in southeast Asia Minor was his birthplace. Paul's parents desired their son to be brought up in Jewish orthodoxy, therefore they brought him to Jerusalem to be taught by the greatest rabbi in Judaism, Gamaliel (Acts 5:34). He soon became one of Gamaliel's best students because of his zeal for the ancestral traditions and the Jewish law. He was a self-proclaimed "Hebrew of Hebrews." (Philippians 3:5). St Paul the Apostle loved God with great fervor. He knew the Hebrew Scriptures like no other. He became a well-known Pharisee, astute in both civil law and God's Law. His life was committed to fulfilling the traditions of the elders and pleasing his God in the process. He had exemplary character. He defended God and the Law like no one else, which makes the rest of the life of Paul the Apostle that much more intriguing. Before he became St Paul the Apostle, he was known as Saul, the Pharisee. Saul heard about an uprising called The Way. A group of followers of the crucified Jesus Christ were causing a commotion in Jerusalem, among other places. In Saul's zeal for defending the Law, he became very aggressive with those in this small uprising. Saul couldn't fathom how these Jews could actually follow someone cursed by God's Law (Deuteronomy 21:22-23). He was convinced the survival of the nation of Israel depended upon his ability to wipe out this new sect who followed Jesus. Saul's (aka St Paul the Apostle) first recorded victim was Stephen who was one of the most outspoken proponents of The Way movement (Acts 7:51-59). 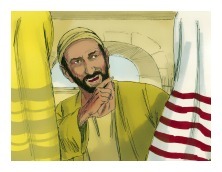 A group of Jews accused him of lies and blasphemy, so Stephen was arrested and brought before the High Council. After Stephen gave a brief synopsis of their common Jewish heritage, he unleashed a harsh tirade against their hypocrisy and murderous ways with God's prophets, which ultimately included the murder of Jesus. Stephen held nothing back and it sent the religious hypocrites into a rage. They drug Stephen out and murdered him at the feet of Saul. Saul endorsed the martyrdom of St Stephen (Acts 8:1) and many other new Christians (Acts 8:3). Saul's work to exterminate The Way and its followers (Galatians 1:13) led him and his entourage on the road to Damascus (Acts 9:1-2). Saul believed Christians were terrible, law-breaking God-haters. His mission was to destroy every person and every thing involved with Christianity. Suddenly, a flash of light from heaven knocked Saul to the ground! Jesus Christ spoke to him from above, "Saul! Saul! Why are you persecuting me?" Saul's companions heard the voice, too, and they were speechless. Jesus spoke to Saul, "I am Jesus, the one you are persecuting! Now get up and go into the city, and you will be told what you must do." Saul's companions led him by the hand to Damascus, directly to a guy named Judas who lived on Straight Street. Saul, completely blind, fasted and prayed to Jesus Christ for three days. Jesus gave Saul a vision of Ananias, a Christian who lived in Damascus. God told Ananias where to find Saul, so he could lay hands on him and restore his sight. Ananias was skittish because of Saul's hostility towards Christians, but God assured him he had converted Saul. Jesus told Ananias that Saul is his chosen instrument to reach the nations with the gospel. 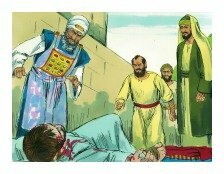 Ananias did as he was told and healed Saul. Saul was immediately baptized and he regained strength by eating a meal. He became a new creation in Christ (2 Corinthians 5:17) and God also gave him his new name, Paul. Henceforth, Saul is known as St Paul the Apostle, or the Apostle Paul. Jesus Christ, in a flash of light, in the twinkling of an eye, converted the murderous Saul into the fiery preacher, Paul. This was a truly amazing turn of events. Suddenly St Paul the Apostle was filled with the Holy Spirit and boldly preaching to the Jews in Damascus. The Jews had no answer for Paul's claims, so they became enraged, scheming to kill Paul. He was rescued by some Christians, settling in an an area southeast of Damascus called Nabatean Arabia. He preached in Arabia and occasionally in Damascus for several years before traveling to Jerusalem. There he met Peter, James brother of Jesus, and the other church leaders. During these first few years of ministry, Paul received much of his knowledge of Jesus Christ through direct revelation. This means that Jesus and Paul spent lots of time directly together. So, in answer to our question, "Did Paul know Jesus?" We must exclaim, "YES! Paul and Jesus did know one another - very well." His former cohorts knew he was in Jerusalem, though, and they became suspicious. In response, the church sent St Paul the Apostle to Caesarea and finally Tarsus, his hometown. A time of peacefulness fell upon the Church and the new believers grew in faith and love towards Jesus Christ. The Church was rapidly spreading throughout the Mediterranean area. Subsequently, the Apostle Paul spent 10 years in and around Tarsus spreading the gospel to the Gentiles, but there are only scant recorded details of the events. Concluding Paul's time there, the Christian leader, Barnabas sent for Paul so the two could minister to the burgeoning church at Antioch. St Paul the Apostle was soon commissioned by the Jerusalem Church to focus on evangelization to the Gentile nations (Galatians 2:1-10). The Book of Acts, chapters 13-28, chronicle some of the highlights (and low lights!) of Paul's four missionary journeys. St Paul the Apostle and Barnabas eventually went their separate ways, but the Apostle Paul brought a co-worker named Silas with him. They evangelized throughout the Galatia region where many churches were planted. The young man Timothy soon joined them, endearing himself to Paul. Timothy became the apostle's lifetime associate (Philippians 2:19-24). St Paul the Apostle, like the other apostles of Jesus Christ, planted churches and ministered to believers. The job wasn't easy then, nor is it easy today! The gospel offends people because it shines light on sin and people hate having their dirty deeds exposed. It goes without saying that Paul suffered many things because of his calling (2 Corinthians 11:23-27). 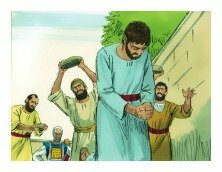 The job is dangerous, but Paul considered himself a slave to Jesus Christ and nothing more. Christ sacrificed his life for us, so Paul believed his life to be a sacrifice to Christ. Do you have the same bold belief as St Paul the Apostle? Paul planted churches in Macedonia, including in the towns of Philippi and Thessalonica. After facing much persecution, he moved south into Greece and started a lively church in Corinth. After some time there, he moved through Jerusalem, Antioch, and then onto Ephesus for several years. It was there that Paul came to the realization that bustling churches had begun in the provinces of Galatia, Macedonia and Achaia and that his work was finished there. God had called St Paul the Apostle to plant churches, not pastor them (Romans 15:20). Paul planned a new journey - his fourth, with Spain as a destination, but with suspected fears (Romans 15:25-32). Paul was attacked in Jerusalem by an angry mob, but saved from death by some Roman soldiers. They brought him to Ceasarea where he remained under house arrest for two years. He then appealed his case to Caesar in Rome, which was accepted. In A.D.59 St Paul the Apostle was sent to Rome where he was held under house arrest for another two years before his case came to court. We don't have the verdict of Paul's trial before Caesar, but a good assumption can be made that he was freed from prison. Paul had a period of freedom, but we'll never know if he was able to evangelize in Spain before his personal martyrdom. While in prison, Paul proved to be a fruitful minister of the gospel. He was allowed to have visitors, so messengers from the churches he planted brought him supplies and money. They also brought him updates and issues from the churches. This spawned the writing of Paul's epistles (aka letters) which are included in our Holy Bible. Paul's epistles are considered the word from God (1 Thessalonians 2:13). From the Rome imprisonment St Paul the Apostle wrote Ephesians, Philippians, Colossians and Philemon. We gain much theological understanding and practical individual and church conduct from Paul's prison epistles. In addition to Paul's prison epistles he also authored the Bible books of Romans, 1 & 2 Corinthians, Galatians, 1 & 2 Thessalonians, 1 & 2 Timothy, and Titus. I don't personally believe that the Apostle Paul wrote the Bible Book of Hebrews, but many fellow theologians do ascribe to his authorship of that epistle. Men as great as St Peter admitted that Paul's writing are so vast, so deep and beyond natural understanding, that no one can doubt that God was writing through Paul (2 Peter 3:15-16). The Apostle Paul understood the Gentile philosophies and religions so well, that he could write specifically to the Gentile perspective. His letters were both theological treatises and practical teaching. He focused on the mystery of Jesus Christ and the indwelling Holy Spirit (Ephesians 6:19). He wrote about the displacement of God's law by faith in God, through Jesus. He also developed much in local church politics. St Paul the Apostle is one of the greatest writers in human history. In response to the question, "How did Paul die?" We can only rely upon tradition. We can trust that the Apostle Paul was condemned and executed not too long after his successful appeal to Caesar. Emperor Nero persecuted Christians for a period and Paul is said to have fallen victim during this difficult time - about A.D.64. He could have been executed with many others at Tre Fontane, which lies on the Ostian Road. It's also very possible that Paul was humiliated in his martyrdom. The stories of Nero's circus atmosphere of persecution are nauseating. The Christian martyr, Apostle Paul, came to rest in Rome at what we know as the Basilica of St Paul. Paul and Jesus had a tremendous relationship that resulted in Paul developing the Christian church. The rapid growth of Christianity came, in part, as a result of St Paul the Apostle's missionary work in the Mediterranean region. Paul was a relentless, God-driven missionary of the Gospel of Jesus Christ. The direct revelation that Jesus Christ gave Paul can be counted on as from God himself. The life of Apostle Paul should inspire you and me to nothing short of a total surrender of all earthly desires and possessions to our Lord and Savior, Jesus Christ. 1) What does the conversion of Saul (aka Paul) say about God's forgiveness? 2) St Paul the Apostle wasn't known as a great public speaker. Do Christians place too much emphasis today on preaching style and delivery? Why or why not? 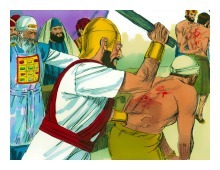 3) Paul was constantly followed, undermined, and attacked by unbelievers. He was often abandoned and ignored by Christians; but also emulated and honored by some who knew Christ. Real Christians face the same battles today, however, with less intensity. What drove Paul to stay so focused and committed to Christ and the Gospel? What can we learn from his relationship with Jesus? I must go on boasting. Though there is nothing to be gained by it, I will go on to visions and revelations of the Lord. I know a man in Christ who fourteen years ago was caught up to the third heaven — whether in the body or out of the body I do not know, God knows. And I know that this man was caught up into paradise — whether in the body or out of the body I do not know, God knows — and he heard things that cannot be told, which man may not utter. After sharing this Bible study lesson on Facebook or Twitter below download your FREE printable Bible Study Lessons (pdf version): St Paul The Apostle, Lesson 2.18. Special Note: I'm grateful to Big Book Media & Free Bible Images, Stock Exchange, Morgue Files, and Stock Photos For Free for the use of their photos for St Paul the Apostle Bible study lesson.